Here’s your chance to experience Baja’s pristine waters, view more whales, spend less time traveling, enjoy small groups and comfortable accommodations. 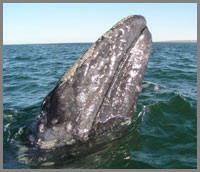 Baja AirVentures has three one-of-kind soft, eco-adventure Baja whale watching tours you’ll love: Two unique Baja whale watching trips on the Pacific Ocean and Sea of Cortez and one Baja whale shark ecotour on the Sea of Cortez that world travelers rave about. Lodging for the popular “Best of Baja’s Whales, Dolphins and Sea Lions” includes a bed and breakfast stay on the Pacific Ocean, as well as time spent at our famous Las Animas Eco-Lodge, where you can experience sea lions, dolphins, and more whales. And with the doubling of whales seen migrating south as reported by the LA Times, you are sure to have amazing close encounters you have dreamed of. This is the ultimate whale watching experience for eco-adventure and nature seekers you’ll always fondly remember. 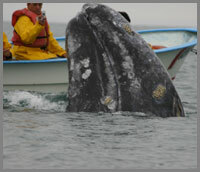 This truly is the best Baja whale watching tour for anyone who seeks more whale watching, less travel and higher comfort. A Whale of a fine time! 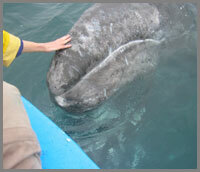 We took our 12 year old grandson to see the gray whales (in the Pacific side of the trip) and were thrilled at the adventure of having them come right up to the boats to be touched. I would say that this is a trip for any age 8-80+. 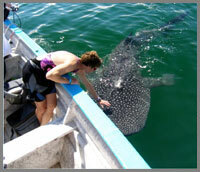 We also offer Baja Whale Shark Tours on the Sea of Cortez August through October. 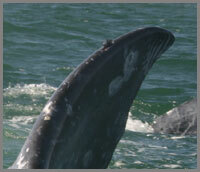 Here’s your best opportunity to view and snorkel with these gentle giants, less then 3 hours from San Diego. They (whale sharks) are gentle creatures… a once-in-a-lifetime encounter will happen (or many more, in our case). 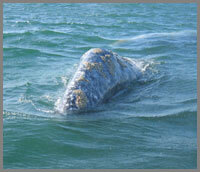 Las Animas Eco-Lodge on the Sea of Cortez has year round Fin Whales and Blue whales and more. Directly in front of our bay is the “Canal De Ballenas” (Whale Canal) where at any given moment you may have fin whale sightings. These majestic creatures are the second largest whales in the world. You may have the chance to see one of them from your yurt’s patio spouting at a distance. Our captains are always ready to take you to have a closer look in our boats. We celebrated our 50th anniversary by returning to Las Animas. Actually we were at the first camp about 11 years ago and remembered the silence and the amazing bright stars. 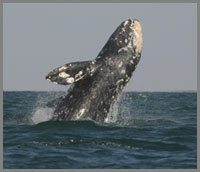 Why choose Baja Airventures for Baja whale watching tours? We give you more time enjoying the beauty of Baja, for less money. We offer comfortable accommodations – private B&B lodging a well as our wilderness retreat. No camping. 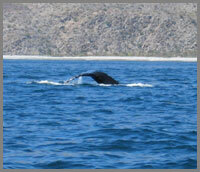 Small groups (no more than 11) and private locations along the untouched Baja peninsula. See and experience more of Baja through the windows of your private carriage. You’ll enjoy more of Baja from the land, sea and air thanks to less travel time. No other operator is able to combine the best of both sides of Baja like we are. Q. 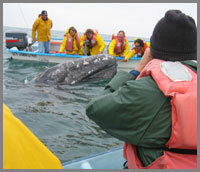 What are the qualifications of your Baja whale watching tour guides? A. At San Ignacio Lagoons and Scammons we use local licensed guides who are accompanied by your English speaking Baja AirVentures guide. They are extremely knowledgeable of the local flora and fauna and have been taking out whale watching tour groups for years. They are aware and abide by the rules and regulations for the safe viewing which includes ways in which to leave them undisturbed. Q. What is your trip capacity? A. The food is fantastic! We boast the best kitchens on both sides of the peninsula! Our cooks offer all you can eat in traditional ranchero style meals, barbecue, fresh fish, home-made tortillas; purified drinking water are all included. Q. How about the accommodations? 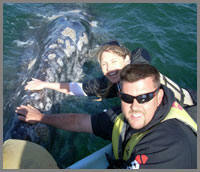 Baja whale watching tours may get you close enough to touch! Imagine the five to six days that you will be able to experience and learn about the outstanding Baja peninsula. This is a diverse and brilliant wilderness area full of contrasts. Only in Baja, Mexico are you able experience four ecosystems: Mediterranean, coastal, desert and mountain, two oceans, and all less than 3 hours from the US. Flying in your own private carriage atop lush green valleys, pine forests, pristine coastlines, and snow capped mountains, endless virgin coastlines and deeply sculptured canyons! 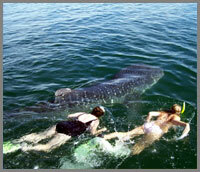 Check out new snorkeling and swimming with whale sharks tours! It’s obvious that Las Animas has been a labor of love. Tranquility, biodiversity and solitude, a staff attentive to all the details: and a perfect amount of Americanism with the kayaks, sailboats, wind and water toys. I’ll be back!